Children can inspire us in so many ways; they have energy, enthusiasm, and an optimism for life that seems unquenchable. At just five years old, Tayler is setting himself as an example for all of us. Read how this boy raised $500 but knew that he wanted to do more, showing all of us how big dreams can grow from small beginnings, and how far hard work can take us. Tayler collected donations for his Water Project. Tayler has always loved Africa. He is fascinated with the animals and wants to visit one day. While he was eating a watermelon one day, he told his mother he wanted to send the seeds to Africa so they could have watermelon for food. When his mother, Kerry, explained that Africa does not have a lot of water and watermelon might not be able to grow, Tayler wasn’t satisfied. “They couldn’t grow watermelons without water, so I wanted to send them water,” he said. Together, he and his mother looked online to see how they might be able to do that, and they found The Water Project. Tayler’s first $500 for his water project came from asking family and friends to contribute to his water jug when they came to the house. He then put jugs in public places — a local store, the gym his mother goes to, and the secondary school where she teaches. 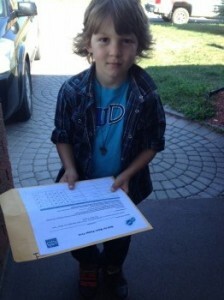 Still wanting to do more, Tayler and his Mom approached the school, LaSalle Secondary School, to make a presentation. He did a slide show for approximately 200 students, and even put a jug on his head to demonstrate how they carry water in Africa. The students were so motivated they did a Walk for Water, walking the streets with jugs on their heads to raise money for the project. Tayler’s influence multiplied as he and the students collected money for the well, going to houses and telling about the project. Together, they added another $3,400 to the project! 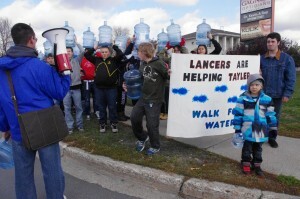 LaSalle Secondary School students join Tayler on his Walk for Water. Determined to earn enough to complete a project, Tayler is still working to reach his goal and as of this writing has raised almost $4,000! Check it out! Tayler says he was surprised at how much money he raised and to learn about how so many people do not have clean water in Africa. Do a good job, and work hard. Simple advice, but so very wise. Tayler’s project can remind us of the infinite possibilities created when we do just that. Want to help Taylor reach his goal? Donate to his fundraising page. Together, it can happen.